Multiple myeloma or myelomatosis, both are different names for the same cancer illness, though sometimes defined as different stages of the cancer development. 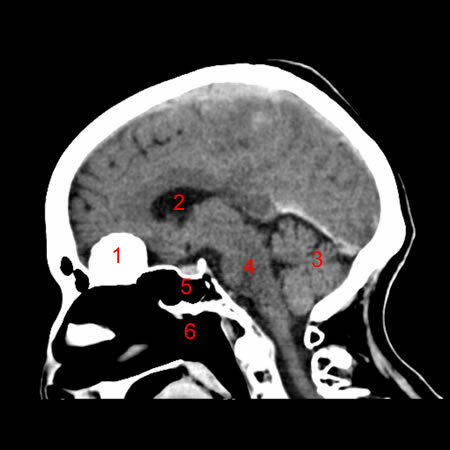 My mother got a myeloma in her head - not in the brain, but in the cavity behind the nose, the so-called rhinopharynx (label 6 in the picture above). It is a rather peculiar place to have, and not to say to find, a tumor. My mother only discovered it when she went to an Ear, Nose and Throat specialist after being bothered by symptoms of a blocked nose for over a month. That was last spring. 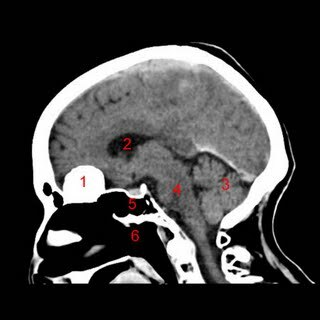 At first the specialists thought they could treat it effectively by an intense radiation therapy through the summer, but unfortunately the tumor was made of harder stuff. Now my mother has had surgery to remove most of the tumor and she is currently going through several rounds of tough chemotherapy to kill the remaining myeloma cells.